When one of the oldest action stories in the world, the Mahabharata ( a Sanskrit epic is mashed together with some inspired Michael Corleone like scenes from the Godfather) the result is another hearland drama from Prakash Jha. With an ensemble cast from Nasseerudin Shah, to Nana Patekar, Manoj Bajpai, Ajay Devgan with some inspired acting from Arjun Rampal, Katrina Kaif and Ranbir Kapoor- this one is worth a dekko at a theatre near you. 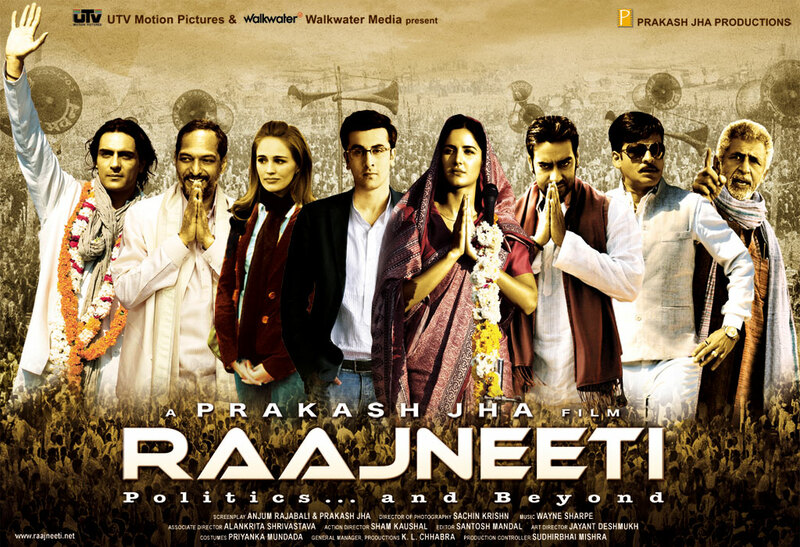 With twists and turns, almost very little music, and action galore along with dramatic scenes subtly mixed in a chutney flavor- Rajneeti shows Politics at its worst and Bollywood movie making at it’s best. and yes Katrina Kaif does look like Sonia Gandhi, but the story is clearly influenced from Karna and Duryodhana from the Mahabharata, and if you are a movie buff you would snicker at the Godfather scenes (like the breaking of the jaw at the hospital, the dead horse er body in the bed etc). This one is the latest hit here in India.